Second text string is from a poem entitled “Das Lied von der Glocke” (The Song of the Bell), written in 1799 by Friedrich von Schiller and set to music by Max Bruch in 1879. 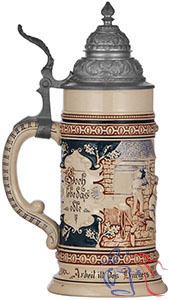 A special order version of this stein (below right) has a custom impressed dedication around the top band reading: “Seinem treuen Kunden zum 25 jähr. Geschäftsjubiläum, gewidmet v. Gust. Oppel. Eisenhandlung Weißenfels” (His loyal customer on the 25th year business anniversary, dedicated from the Gust. Oppel. Ironmongery Weissenfels). Pricing is unaffected.